Ultraflex Systems is the premiere developer and supplier of PVC and specialty substrate digital media. Our PVC and specialty substrate media is used by imaging professionals and advertisers worldwide to create outstanding carpet graphics, banners, billboards, building wraps and more on wide-format solvent, eco-solvent, Latex, dye-sublimation, UV and/or screen printing equipment. Ultraflex Systems is proudly renowned as the leader in the industry that is able to meet the needs of the ever-changing digital world we live in today with the innovative products we bring to the market each and every year. FloorFlex Digital is our printable floor graphics media and comes available on 78” and 126” rolls. 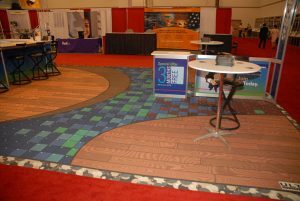 It’s UV and Latex printable and is a vinyl flooring product used for many of the same applications as our carpet graphics media. Floorscapes is another vinyl flooring media produced by Ultraflex Systems. This product comes in 75 mil thickness and is available in rolls of 120″ by 60″. Floorscapes is an innovative, durable product that provides a matte, smooth finish. Sports arenas, restaurants, movie theatres, transportation centers and more are just a few of the countless potential applications for Floorscapes. Ultraflex Systems offers samples to professionals in the USA, England, Scotland, Mexico, Canada and other countries worldwide to ensure that the selected media produces desirable results when printed on their in-house equipment. Contact us today for more information or to request carpet graphics and other media samples.